Elektra is the Mycenaean princess whose father, Agamemnon, was murdered by her mother, Klytemnestra, leaving Elektra hell-bent on revenge. As Richard Strauss's staggeringly powerful orchestra moves inexorably toward the opera's hair-raising finale, the music gives you a composer at his zenith -- magnificently theatrical and devastatingly moving. "...But the final scene was a knockout. Stemme and Paterson, sister and brother, reunite in tender joy and then commence their parents� brutal murder, swept along by conductor Runnicles and rolling waves of orchestral sound. The last few minutes are intensely gripping, the emotional release of the musical transformation overwhelming, as Elektra�s awful waiting game rages to its bloody end. It�s the kind of payoff that gives grand opera its name." 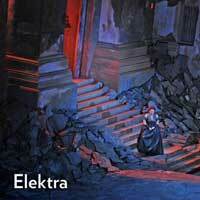 "...The great power of Richard Strauss� �Elektra� lies in the transmogrification of a timeless tragedy through harrowing vocal music reinforced by an orchestral score so vivid, so nearly verbal, that it might stand alone as a symphonic drama. The magnificence of Lyric Opera of Chicago�s current production resides in the depth of its humanity � that depth sounded by tremendous vocal performances and orchestral playing, under Donald Runnicles, that is absolutely graphic." "...The first show I ever reviewed in Chicago was The Hypocrites� All Our Tragic at the Den Theatre, a marathon twelve-hour distillation of every surviving Greek tragedy. It was an extraordinary experience. I�ve also seen a one-night performance of the complete Oresteia of Aeschylus and read both Sophocles� and Euripedes� versions of Elektra. To sum up, I was fully prepared to love Richard Strauss�s operatic version. And I was getting excited remembering Lyric�s production of the German composer�s Der Rosenkavalier two seasons ago starring Amanda Majeski." "...Although the story is from ancient Greece, Richard Strauss�s mad Elektra could have only come at the turn of the last century. Famously rejecting the verisimilitude that was predominant in opera at the time, Strauss took the audience inside the mind of his vengeful, deranged protagonist. It is a place filled with symbols, shadows, and apparitions too dreadful for the waking world. Sir David McVicar, whose similarly sinister production of Il trovatore played at the Lyric earlier this season, has created a Freudian hellscape this time more in keeping with the dissonant music. Making her Lyric debut in the title role is the unforgettably haunting Nina Stemme." "...All the performers acquitted themselves roundly, including the many non-singing actors in the production. These talented and highly trained performers play leading roles in opera, musical theater, and straight theater all over the city, as well as nationally and internationally. Their faces, voices, and art are well recognized throughout Chicago; their craft in multiple artistic forms is highly respected." "...Lyric Opera�s production of �Elektra,� last seen here in 2012, has found its ideal cast this time around with singers whose spectacular, powerhouse voices are matched by superb acting skills. Originally directed by Sir David McVicar, this revival � with its monumental but treacherous architectural set by John Macfarlane � clearly thrives on the skills of Nick Sandys, the longtime artistic director of Chicago�s Remy Bumppo Theatre and a fight and movement director for Lyric. He has turned every scene into a play rather than a presentational vocal exercise." "...Directed by Nicolas Sandys as a revival of Director David McVicar�s production, the 2019 �Elektra� is not a stand and sing to the audience opera. Instead, it is dramatic theater that combines exceptional singing and acting with Strauss� turbulent music played by the Lyric Opera Orchestra conducted by Donald Runnicles. "...The singing performances-all-struck this writer as nuclear powered and showing great stamina, especially by Stemme. Martens also is riveting. You too may be wondering if it is that Elza Van Den Heever's voice is especially sweet or if Strauss gave her part of Elektra's sister Chrysothemis easier to latch on to arias."